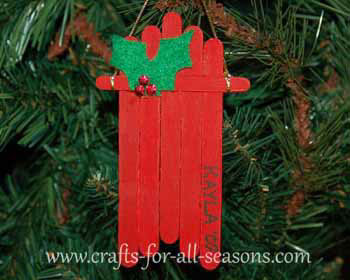 This sled ornament is the perfect Christmas craft for a child or an adult to make. These tend to sell well at craft bazaars too, especially is you offer to personalize the sled ornaments with a person's name. All that is needed is some wooden craft sticks, paint, and some glue. 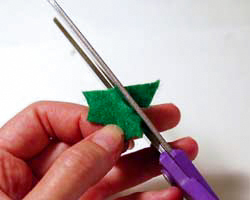 Felt is used for an embellishment and a cord is added for hanging. This little sled looks adorable hanging on the tree. 1. 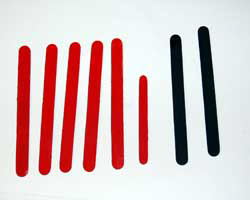 Begin by painting five of the large craft sticks red. You will need to paint both sides, so you will have to let one side dry, then do the other. 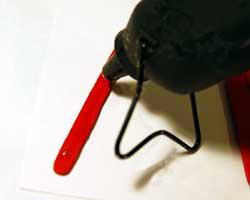 Also paint the small wooden craft stick red on both sides. 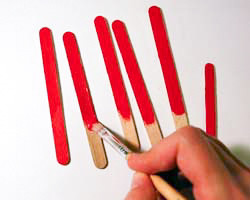 Paint the last two wooden craft sticks black on both sides. 2. 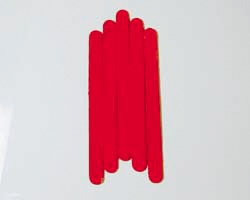 Next, assemble the five large wooden craft sticks in a shape that resembles a sled, as shown below. 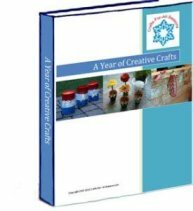 Apply a thin amount of glue to the side of each craft stick to glue them all together side by side, then glue the small wooden craft stick perpendicular across the top of all of them to secure. 3. Next we want to add the blades to the sleigh. 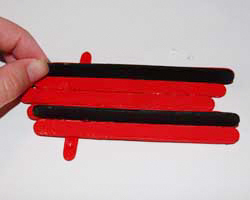 Glue the two black sticks to the bottom of the sled, lengthwise so they are standing up like the sled's blades, as shown. 4. To add some holly to the sled, cut out some holly leaves from some green felt or green foam board, and glue them on the top of the sled. 5. 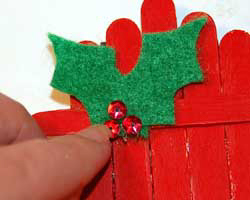 Next, add a few drops of glue to the top of the leaves, near the corner, and place three red sequins on top of the glue to be the holly berries. 6. 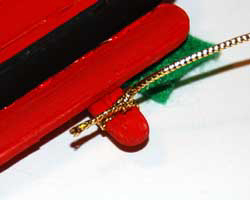 Tie a small length of cord to the sled ornament. You can tie each end around the small craft stick that acts as the cross support. 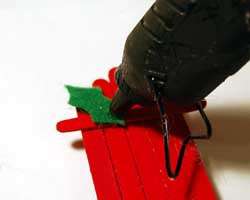 Keep the knot in the back of the ornament for a neater look, and secure the knot with a drop of glue on top of it when you are finished. 7. You can personalize the sled ornament with your name, or the name of the child who made it. Just make sure to use a black permanent marker like a Sharpie.